A common complaint I hear from readers is that their “laundry room” is in a horribly less-than-ideal location, such as the garage or the basement. Laundry is difficult enough to manage without having to wash clothes in a place that was really meant to park a car. So today we’re going to talk about ways you can still have a “laundry room” in your garage without losing your mind. There are some simple strategies you can implement to make your laundry room/garage seem more tolerable. And all of them don’t involve money (yay!). So read through these solutions and make a plan to make your laundry room experience in your garage a little more bearable. Get It Clean. I mean really clean. When I was growing up, my best friend’s parents had their laundry room in their garage. And it was the cleanest garage I’ve ever seen to date. Y’all, my friend’s mom vacuumed the garage floor. That’s some serious cleaning right there. I’m not saying that you need to go vacuum your garage floor (although you could if that kind of thing makes your heart sing), but starting with a good, thorough cleaning would make your laundry room/garage seem 100 times better. Take as many items out of your garage that you can. Sweep down all of the cobwebs, get rid of the spiders, giveaway any and everything that needs to go to a new home, and sweep the floor meticulously. You will not believe how much better you’ll feel just completing this one step. No one likes to work in gross conditions, whether that room is your garage or not. Now, if you can’t take more than 3 steps in your garage without tripping over something, that’s a different issue. You’ll need to devote a weekend (or two) to getting rid of a few things. But I promise you: it feels so good to have things straight and clean. You’ll be ridiculously more productive in a place where you can actually walk around. After everything is nice and clean, you need to organize your laundry space. Now you may have to spend a little bit of money here, as organizing supplies/shelving aren’t always cheap. But I will assure you if you can get the space clean and organized, it won’t seem so tortuous, despite the fact that you’re in the garage. Do you have overhead cabinets you can use in your laundry area? Can you install some utility-type shelving above your washer and dryer? Would it work better in your particular space to have a rolling cart to house your laundry supplies? Since a garage is a little different than having a ‘real’ room, you will probably have to be a bit more creative in finding the perfect organizing solution for you. Spruce it up a little. Just because your laundry room is really a garage doesn’t mean it has to be dark and dreary. 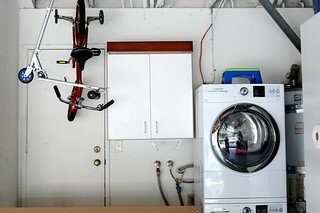 Can you paint the corner of your garage where your washer and dryer sit? Are the windows where you could put up a nice valance? Is there a spot to hang a bulletin board with all of your favorite little stain makers? After your floor is clean (see above), is there room to put a small rug? You know your own style. If you prefer things on the plainer side, then streamline. If you prefer things to be pretty with flair, search Pinterest for some fabulous laundry room inspiration and get busy. Make it look like a place you actually want to be. I’m not sure how it works up north, but here in the south we don’t have temperature-controlled garages. It’s no fun doing laundry in a steamy hot garage when it’s 95 degrees outside. And I can imagine it’s even worse going out to the garage when it’s freezing cold. So how do you have to modify your garage to make it bearable in more extreme temperatures? Do you need to put in a space heater? A garage fan? An all-in-one heating/cooling window unit? Do you need to insulate your garage door? The garage windows? Could you install one of those shop lights that radiates a lot of heat to help out in the cold winter months? The trick to this step is implementing your fix before the temperatures become extreme. I can promise you will be much less cranky if you choose to install that garage fan in 70 degree weather as opposed to 98 degree weather. Prevent trouble before it starts. To prevent future headaches, make sure you take care of these problems before they happen to you. Make sure you vent your dryer to the outside. And by all means, please make sure your dryer vent is clean. I just heard of another dryer fire in our community this past week caused by a clogged dryer vent. If you live in an area that has the occasional freezing temperatures, make sure your water lines to your washer are insulated. Frozen pipes are no fun. A garage full of water after the pipes unfreeze is even less fun, I would imagine. Is your laundry area in your garage? Does it drive your crazy or do you find it to be completely manageable? Share your best tips. Looking for more help for dealing with garage issues? For tips on how to spruce up your garage, visit Christine at i Dream of Clean. Taylor at Stain Removal 101 gives tips on cleaning the garage floor, especially oil spills. Nony from A Slob Comes Clean talks about all of the ways that pegboard can help you utilize that space on your garage walls. Jami from An Oregon Cottage shows ideas for remodeling a garage living area. I’ve had a garage laundry room for the past eight years. For the most part I don’t mind it. It’s actually nice to be able to have it in the garage rather than in piles in a hallway or such. I have a clothes rack in the garage where I hang clothes as I pull them out of the dryer and put them on hangers and a table where I can fold. So, I really have a lot more room than if I had just a laundry closet in the house. The biggest downfall is the temperature, especially in the summer when it’s over 100° here. So when the temperature is an issue, I try to do laundry early in the morning when it’s not so hot. I have had my laundry in the garage before and so happy I do not have to do that anymore, but I sure could have used suggestions when it was out there. I hated it worst when it was really cold! Growing up, our laundry room was in our garage too. My parents kept a fairly large carpet remnant (10×10 maybe?) in front of the washer & dryer so that my mom had a warmish place to stand in the winter and a soft place to stand in the summer. It was also a nice place for me to sit and relax when I felt like being out of the house but didn’t want to be completely outside…or as a nice place for our dog to sleep if the weather was exceptionally cold or rainy. My dad also had a pretty nice seating area set up in the garage, complete with a fan, a space heater, a “coffee table” and a small TV/Radio, so he could watch the news or a football game while smoking his cigars and reading his paper (he chose not to smoke inside the house). I hate our laundry room in garage. Mainly because I hate dragging dirty hamper through the kitchen & it’s too far from our bedroom. To me, I think dirty clothes shouldnt be dragged through the kitchen at all. & it should stay far away from the kitchen as much as pissible.. I wish our laundry room was near our bedroom rather. I think it’s a good idea to utilize your garage as a laundry area if it’s not being used for another purpose. Surely gonna move all of my laundry cubicles from my gallery to the garage.